It's the end of one month and the beginning of another so it's time for my favorite update: my dividend update. These dividend updates reflect all dividends that I receive through my investing pursuits. I hope they can help inspire you to take control of your own finances and invest to build a passive income stream. What you use that stream for is up to you, whether it's to fund early retirement, just provide some FI/FU money, or even to provide for an annual vacation; the key is that it can provide options and open up all sorts of possibilities. You can check my dividend income or progress pages to see what dedication to an investment plan can give you. January's dividends weren't nearly as strong as December's; however, you won't hear any complaints from me. My FI Portfolio produced $336.88 in dividends for January while my Folio First portfolio chipped in another $10.66. My Roth IRA added another $47.88 for the month. Across all 3 accounts I received $395.42 in January. The power of joining the corporate ownership class is that those companies can work much harder for you than you can. Think about it. By myself I have to devote my own time to my regular job in order to make money. However by buying a stake in a high quality business I now get to leverage my own time that I exchanged for money into companies that are working around the clock to make products or provide services for their customers. Those companies are working 24/7/365 which means that I make money even when I sleep. During January the companies I own paid me $12.76 per day or $0.53 per hour. As I mentioned above my FI Portfolio produced $336.88 in dividends last month. That's a 15.7% increase compared to October and a 22.2% increase compared to last January. I have to say that I'm pretty happy with those results. My Roth IRA likewise showed solid growth. Compared to October January showed 3.1% growth and compared to January of last year it was 23.3%. Considering that was 100% from organic dividend growth and dividend reinvestment those are some big numbers. In January 6 of the companies I own in my FI Portfolio announced dividend increases. You mean a company I own a piece of, albeit tiny, wants to pay out more of their profits to me just because I own part of the company? Sign me up! Combined those 6 companies boosted my forward 12-month dividends by $48.19. 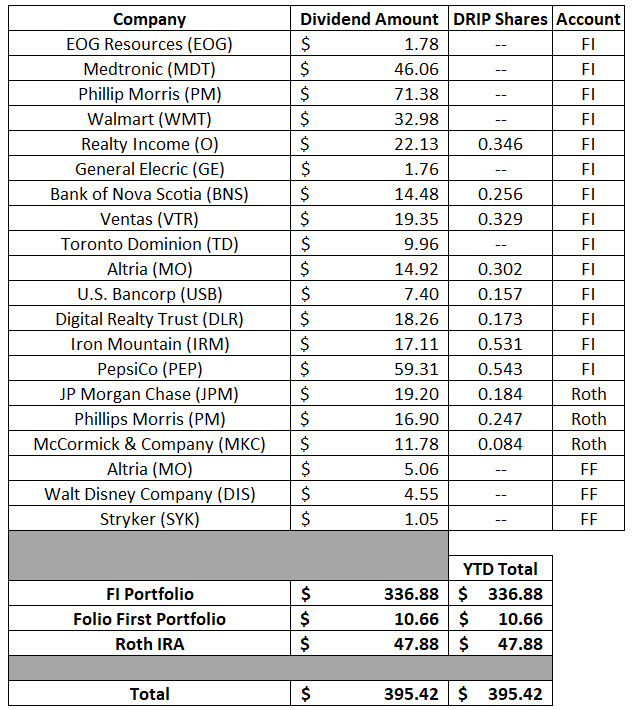 Thus far in 2019 I've received 6 increases from 52 of the companies within my FI Portfolio combining to increase my forward 12-month dividends by $48.19. My forward 12-month dividends for my FI Portfolio ended January at $6,731.63 while my FolioFirst forward dividends are at $92.18. That brings the total taxable account forward 12-month dividends to $6,823.81 My Roth IRA's forward-12 month dividends increased to $414.23. Across all 3 accounts, assuming no dividend cuts or position size changes, I can expect to receive at least $7,238.04 in dividends over the next year. Below is the chart showing the monthly dividend totals for each year that I've been investing as well as the monthly average. It's not always an increase as some companies have weird payout schedules, as we saw above, and eventually some positions will get dropped, but the long-term trend is what matters. The rolling 12-month monthly average for my FI Portfolio is at $530.04 per month which is a $5 above 2018's monthly average of $524.95. 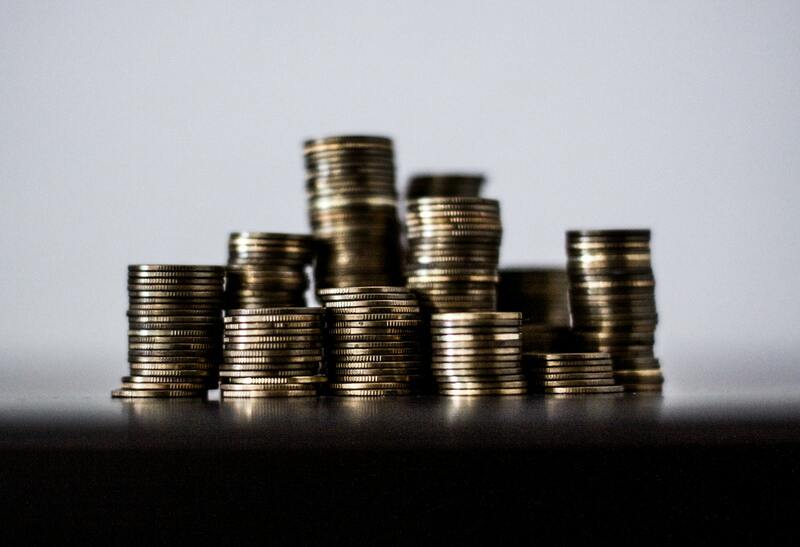 I've updated my Dividend Income page to reflect January's changes. With one month officially over and done with for 2019 how were your dividends? JC - Great month my friend. Those are some great names and I'm glad that we are fellow shareholders for so many of them. I have some catching up to do on your website, because I see many articles title "Purchase" and I'm pretty excited! Good job. A $48 dollar in crease over the month just from dividends is awesome. Keep it up. PepsiCo: Is It One Of The Best Dividend Stocks? Is Archer Daniels Midland A Good Investment? Is Honeywell International A Buy?